Polished is excited to announce that we are now carrying an amazing skin and body care line that you will fall in love with! FarmHouse Fresh is a Texas-based company with scrumptious products crafted around delicious food and drinks. 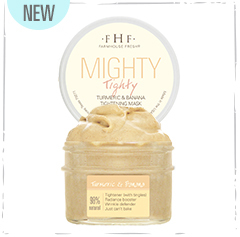 FHF ensures that each of their formulas is 89-99.6% natural, many of them being vegan and gluten free. They take pride in using natural and naturally derived ingredients, chock-full of fruits, vegetables, milks, and other ingredients from farms across the U.S., including a farm of their their own. With delightful packaging and whimsical names, FarmHouse Fresh evokes a sense of warmth and nostalgia with their skincare and body care products. Always paraben- and sulfate-free, their charming concoctions will bring a smile to your face and promote healthy, radiant skin. Polished has put together four amazing FarmHouse Fresh Facial Services to ensure you get to experience all that these wonderful products have to offer! Make sure to book your FarmHouse Facial experience today, your skin will thank you for it! Listed below are our new FarmHouse Fresh Facial services, be sure to read about each one so that you can book the facial that is just right for you and your skin. Great for a first time facial client or a guest interested in new skin care. The Micro Facial begins with a consultation to form a customizable blend of FarmHouse (FHF) products for your skin care needs. One Fine Day is the triple threat. It is a gentle cleanser, exfoliator and moisturizer all in one! This magical blend in a jar contains micro sugar crystals and nourishing shea butters to pave the way to baby soft skin after just one use. The Guac Star avocado mask is used to support the fatty acids that make up the outermost layer of skin that help protect from oxidative stresses. Three Milk Moisturizer is a shine-free, daily deep wrinkle-reducing moisturizer. It is blended with nourishing botanical milks, along with a clinical peptide to erase the look of fine lines and bring a youthful glow to complexion every single day. To complete your facial, enjoy a relaxing hand massage with FHF Milk Lotion. The Purifying Facial begins with an in-depth consultation to offer a customizable blend of FarmHouse Fresh (FHF) products for your skincare needs. As we cleanse the face with gentle Green Tea Milk Wash, the skin is prepared for your exfoliation treatment. One Fine Day is a three in one face polish with Montmorillonite clay that attracts and absorbs bacteria and toxins. Pumice naturally clears dead skin cells, while Willow Bark Extract has strong astringent and is anti-acneic. To refine we apply Peat Perfection, an enriched vegetation mask that includes Kaolin clay, removes impurities from the skin, helps balance oils, and unclogs pores making them look smaller. A refreshing Vitamin Berry alcohol-free, rose water tonic instantly hides the look of pores, smooths skin, and boosts moisture content with ingredients to help the skin look younger and brighter. The Three Milk Moisturizer is a shine-free, wrinkle-reducing moisturizer. It is blended with nourishing botanical milks, along with clinical peptides to erase the look of fine lines and bring a youthful glow to the complexion. To complete your facial, enjoy a relaxing hand and arm massage with FHF Milk Lotion. The Tightening Facial begins with an in-depth consultation to offer a customizable blend of FarmHouse Fresh (FHF) products for your skin care needs. As we cleanse the face with the gentle Green Tea Milk Wash, the skin will be prepared for your exfoliation treatment. One Fine Day is a three in one face polish that will fight wrinkles through deep penetration of vitamin E, helping improve elasticity and aiding in moisture retention. Farmhouse Fresh Facial Buffing Masks are made with a select blend of wholesome ingredients that help buff, balance, hydrate, and nourish all types of skin. We will pick the mask best suited for your skincare needs! From fresh-blended active yogurt to organic pumpkin puree, and more — pores get deeply cleansed and skin gets a new, refreshing start. The refreshing Vitamin Berry alcohol-free rose water tonic instantly hides the look of pores, as it smooths skin, boosts moisture content and helps the skin look younger and brighter. 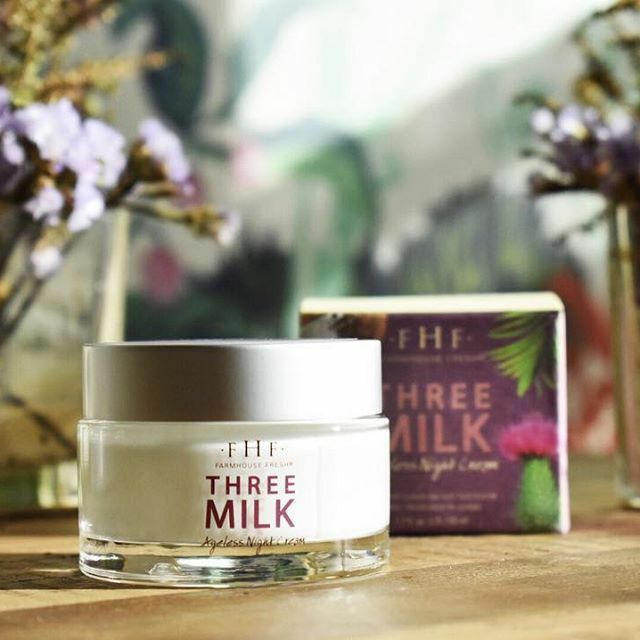 Three Milk Moisturizer is a shine-free, deep wrinkle-reducing moisturizer. It is blended with nourishing botanical milks, along with clinical peptides to erase the look of fine lines and bring a youthful glow to complexion. To complete your facial, enjoy a relaxing hand and arm massage with FHF Milk Lotion. The Radiance Boosting Facial begins with an in-depth consultation to offer a customizable blend of FarmHouse Fresh (FHF) products for your skin care needs. As we cleanse the face with the gentle Green Tea Milk Wash, the skin will be prepared for your exfoliation treatment. Sand your Ground Mud Mask is a dual-action, clarifying mud exfoliation mask that contains fine pumice to polish skin to silky smoothness. Red Arizona Montmorillonite Clay absorbs bacteria and toxins for the ultimate skin renewal. We will refine your fresh skin with a Farmhouse Fresh Buffing Mask best suited to your skincare needs. These unique masks made of wholesome ingredients will help buff, balance, hydrate, and nourish all types of skin. A refreshing Vitamin Berry alcohol-free rose water tonic instantly hides the look of pores, as it smooths skin, boosts moisture content with ingredients to help the skin look younger and brighter. The Three Milk Moisturizer is a shine-free, deep wrinkle-reducing moisturizer. It is blended with nourishing botanical milks, along with clinical peptides to erase the look of fine lines and bring a youthful glow to the complexion. To complete your facial, enjoy a relaxing hand and arm massage with FHF Milk Lotion. Our #1 selling face cream will now transform your night! This wonder milk is uniquely rich and intensely hydrating, with a time-release delivery system of pure form retinol. Many retinol products cause redness and irritation. Not Three Milk Ageless Night Cream! The slow-release system ensures it delivers softness, illumination, firmness and more – without the side effects normally associated with pure form retinol. Feel tight, tingly and radiant with this antioxidant-rich blend of turmeric, fresh bananas, and New York-grown echinacea extract full of active compounds that nourish skin. Turmerones, found in turmeric oil that is extracted from the roots of turmeric, contain significant amounts of antioxidants that fight free radical damage. Plus, banana pulp and peel are rich in provitamin A, carotenoids, and phenolics that help skin with healthy growth, repair and protection.